Everybody knows there are a number of ways in which you can improve the quality of water in your home. What adds increases your homes water quality may not be the same system that is bringing quality water to your neighbor. Your waters specific needs are based on exactly what issues are found when analyzing your homes water. One system that is often recommended to improve your water is a reverse osmosis drinking water system. If your water is analyzed and has a high concentration of metals, minerals, or microorganisms a reverse osmosis may be your best option. 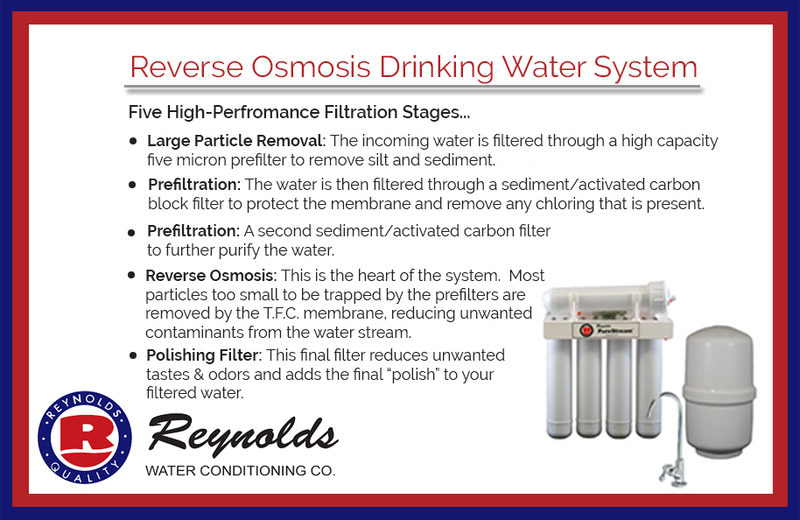 Reverse osmosis systems improve the overall taste of the water in your home. Below we will answer a number of questions that are often asked about RO, reverse osmosis, water treatment solutions. Can you use a RO system to remove sodium in your water? YES! RO can remove up to ninety eight percent of sodium in your homes water. It is a perfect combination when homeowners are concerned with the sodium levels in their water from using a water softener. RO systems also are used to remove chlorine, lead, nitrates, and several other impurities in your water. What is the difference between the four and five stage RO systems? Four Stage RO: A four stage RO system is used within most homes where the water is being treated by a whole house water treatment unit such as an iron filter or water softener. Five Stage RO: When a whole house water treatment unit is not used within the home the best option is to use a five stage RO system. This option gives you additional protection in an added filter for contaminants such as arsenic and nitrates. There is no need to use a RO system less than four state as it will not provide the needed filtration. The opposite is true of any RO system over five stage which is an overkill and considered a waste of money. Filters are costly and the more filters that need to be changed the more money spent. Why waste money on RO filters that are not adding to the actual filtration of the water. Can a RO system be used in conjunction with an ice maker or my refrigerator water? YES! RO refrigerator kits are available with thirty-foot hoses and all the fittings needed to be used with your home’s refrigerator. Think about the crystal-clear water and un-cloudy ice cubes you will be enjoying when your refrigerators RO system is used. To understand if a RO system could improve the quality of your homes drinking water bring in a sample of your water to be analyzed by the experts at Reynolds Water Conditioning. The experts at Reynolds Water Conditioning have a solution to your homes unique water quality needs including: arsenic, bacteria, chlorine, rotten egg smell, fluoride, hard water, iron, lead, acid, tannins, radon, and more. More information on our water treatment solutions including water softeners and conditioners, water filtration and purification, reverse osmosis drinking water, and iron & odor removal can be found online at https://reynoldswater.com. Next: Next post: The Million Dollar Question: How Do I Get My Website on The First Page of Google?